Petrol stations across Portugal are running dry just days after tanker drivers began a nationwide strike over pay and conditions. The country declared an energy emergency on Tuesday, and drivers agreed to supply essential services including hospitals and airports. But widespread shortages have prompted queues at petrol stations across the country, while some have closed. Among their demands, the drivers are pressing for double the minimum wage. Before the agreement to supply essential services, airports reported that they were running low on fuel supplies, which could have delayed or cancelled flights. Tuesday's agreement did not include any possible solution to the strike, officials said, and the union has only agreed to supply minimum quantities. But the minimum service should guarantee supplies for emergency and rescue services, Prime Minister Antonio Costa said. At one petrol station in the suburbs of the capital, Lisbon, a queue of at least 50 cars stretched for hundreds of metres, AFP news agency reported. Thousands of other service stations had been completely emptied, it said. Portugal's Minister of Economy Pedro Siza Vieira asked citizens not to rush to the pumps to help avoid any further shortages. 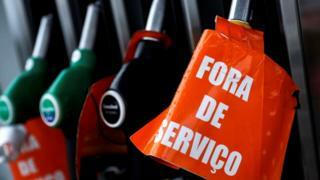 Portuguese newspaper Diário de Noticias reported that soldiers were on standby ready to drive fuel trucks if necessary. It added that the strike was "threatening to spoil the Easter weekend for many families, and business for many companies". The newspaper warned that the strike was planned to continue "indefinitely", or until union demands were met. The union is comprised of drivers who specialise in the transport of hazardous substances. They want to be recognised for their specific skills and to be considered separately from other forms of heavy vehicle drivers. They are also seeking changes to salaries and long working hours.